Summary: The Lord broke off and saved a small tip of the once massive cedar tree that was the Davidic kingship. In the fullness of time, He transplanted it, placing Himself in the womb of the Virgin to be born in David’s town and to rule not only Israel but all Creation as its King. Yet His rule was not of violence and force but of love, reconciliation, and peace, both between God and mankind and between all who trust in His power to save. Text: Thus says the Lord God: “I myself will take a sprig from the lofty top of the cedar and will set it out. I will break off from the topmost of its young twigs a tender one, and I myself will plant it on a high and lofty mountain. 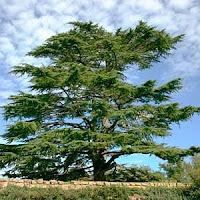 On the mountain height of Israel will I plant it, that it may bear branches and produce fruit and become a noble cedar. And under it will dwell every kind of bird; in the shade of its branches birds of every sort will nest. And all the trees of the field shall know that I am the Lord; I bring low the high tree, and make high the low tree, dry up the green tree, and make the dry tree flourish. Audio: Click to hear the MP3 of The Transplanted Tree, preached to the saints of God at Faith Lutheran Church, Knob Noster, Missouri.